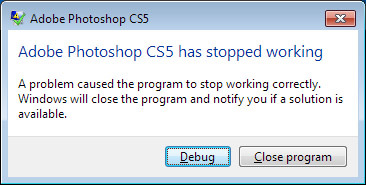 On my new Lenovo W520 (Intel Core i7 vPro), Photoshop CS5 won't run unless I disable Microsoft service "Windows Management Instrumentation." Any hunches about a workaround other than removing WMI? Does it give any specific error or warning? it to changing to 4-core laptops. Not clear that I need WIA as I use security from others. k' let me see if someone on the team can repro. Thanks, Jeff. Let me know what you find.